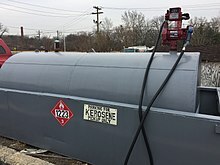 Kerosene, also known as paraffin, lamp oil, and coal oil (an obsolete term), is a combustible hydrocarbon liquid which is derived from petroleum. It is widely used as a fuel in industry as well as households. Its name derives from Greek: κηρός (keros) meaning wax, and was registered as a trademark by Canadian geologist and inventor Abraham Gesner in 1854 before evolving into a genericized trademark. It is sometimes spelled kerosine in scientific and industrial usage. The term kerosene is common in much of Argentina, Australia, Canada, India, New Zealand, and the United States, while the term paraffin (or a closely related variant) is used in Chile, eastern Africa, South Africa, and in the United Kingdom, and (a variant of) the term petroleum in Croatian, Czech, Danish, Dutch, Estonian, Finnish, German, Hungarian, Latvian, Serbian, Slovak and Slovenian. In some of these languages the term kerosine refers instead to jet fuel. The term lamp oil, or the equivalent in the local languages, is common in the majority of Asia. Liquid paraffin (called mineral oil in the US) is a more viscous and highly refined product which is used as a laxative. Paraffin wax is a waxy solid extracted from petroleum. Fortunately, Gesner recalled from his extensive knowledge of New Brunswick's geology a naturally occurring asphaltum called albertite. He was blocked from using it by the New Brunswick coal conglomerate because they had coal extraction rights for the province, and he lost a court case when their experts claimed albertite was a form of coal. In 1854, Gesner moved to Newtown Creek, Long Island, New York. There, he secured backing from a group of businessmen. They formed the North American Gas Light Company, to which he assigned his patents. The petroleum discovery at the Drake Well in western Pennsylvania in 1859 caused a great deal of public excitement and investment drilling in new wells, not only in Pennsylvania, but also in Canada, where petroleum had been discovered at Oil Springs, Ontario in 1858, and southern Poland, where Ignacy Łukasiewicz had been distilling lamp oil from petroleum seeps since 1852. The increased supply of petroleum allowed oil refiners to entirely side-step the oil-from-coal patents of both Young and Gesner, and produce illuminating oil from petroleum without paying royalties to anyone. As a result, the illuminating oil industry in the United States completely switched over to petroleum in the 1860s. 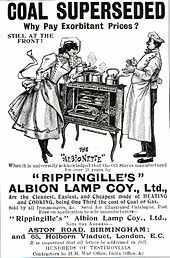 The petroleum-based illuminating oil was widely sold as Kerosene, and the trade name soon lost its proprietary status, and became the lower-case generic product “kerosene”. Because Gesner’s original Kerosene had been also known as “coal oil,” generic kerosene from petroleum was commonly called “coal oil” in some parts of the United States well into the 20th century. This page was last edited on 11 September 2018, at 12:03 (UTC).